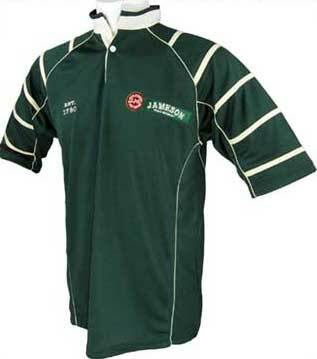 This official Jameson rugby shirt is enhanced with Est. 1780 embroidered on the right chest along with Jameson embroidered on the left chest, the right sleeve and on the back below the collar. This dark green Jameson rugby shirt is accented with white trim and it features the branding of the famous Irish whiskey. The Irish rugby jersey features a 100% polyester high-performance breathable fabric and has embroidered and appliqué Jameson Whiskey designs. Irish rugby shirt features the Guinness trademark on this long sleeve black jersey with cream accenting. Irish rugby shirt is a short sleeve forest green jersey that features a traditional design that includes shamrocks.